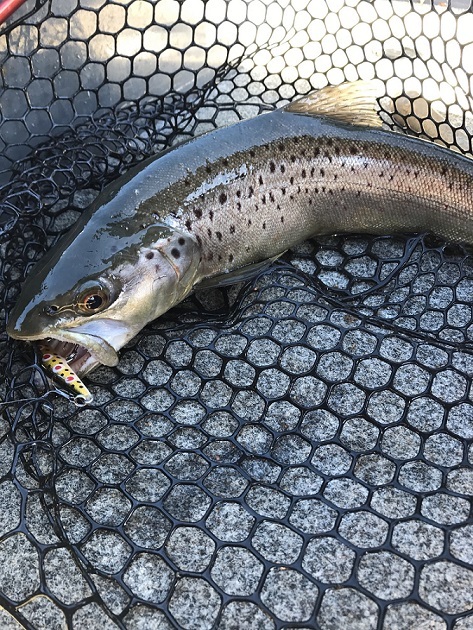 Fly fishing on the lake has been up and down in places but it’s on the Improve with good reports coming from Rushes, Middle Bank, Seven gates, Braemer Bay. down around seven gates and rushes nymphs and woolly buggers are getting some good rainbows likewise middle bank. Overall the fly fishing has been good and thing are going to Improve from now on. Like Eucumbene the lake is rising . Reports this year on the spawn run have been good the browns have finished and the rainbows are heading up and things are looking good so lets hope thing will Improve on the lake this year. Best flies are woolly buggers , Nymphs, Mrs Simpsons with a slow retrieve. Best places are the big bays and rocky points. Overall the flie fishing has Improved lets hope this lake fishes well this year as it can be one of the best lakes around at the moment it’s looking good. Well what a great winter it has been the spinning and trolling has been at it’s best. The trolling has been good from braemer bay down to seven gates with tassies and blades doing the work most colours are doing the job. Spinning has been at it’s best with plastics and minnows best days are cloudy and windy days if the sun is out go to the deeper waters overall it’s been great from the top end to the bottom end of the lake. 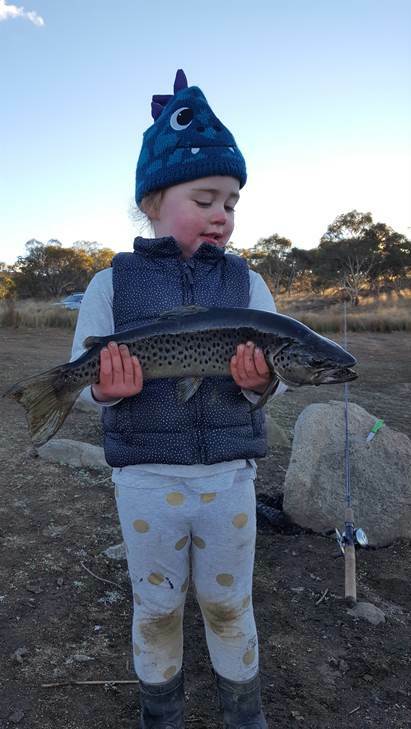 the fishing: We headed to Hatchery Bay for a few hours and couldn’t entice a bite on either power bait or scrub worms. 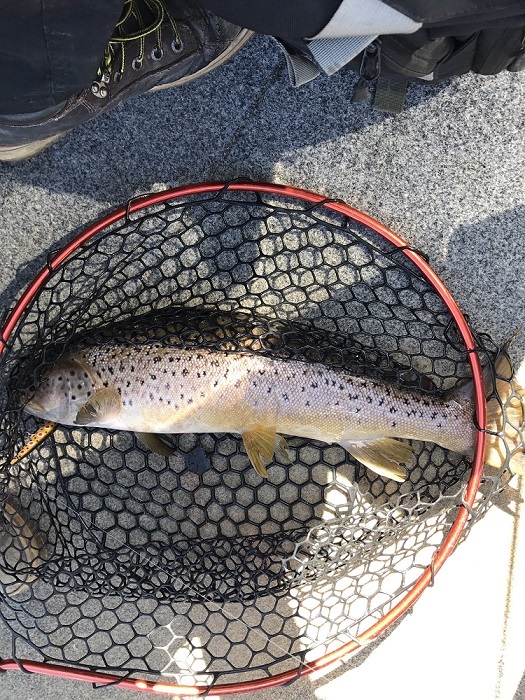 We moved around to Curiosity Rocks and managed to pick up this nice 4 1/2 lb brown on a worm. Jasmine and I headed up to Jindy for a day trip on Sunday. It was a perfect day out on the water. We picked up a few good fish with this one easily being the biggest. It took a Rainbow Trout rapala CD7 and was chock-a-block full of yabbies. 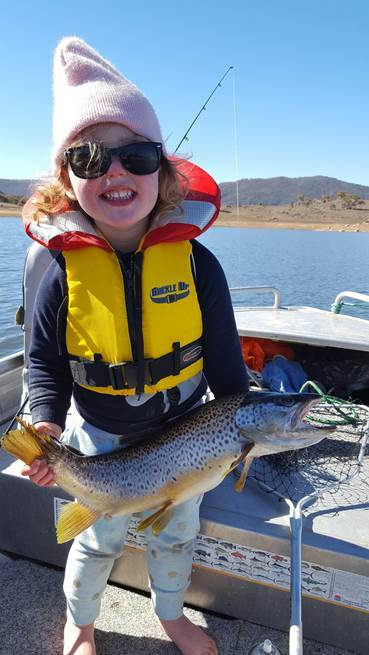 Bait fishing has been at it’s best with good reports coming from most areas around the lake. If you haven’t tried spinning with plastics yet you should the rainbows have been hitting them like a steam train and the browns well they love the yabby patterns so we have a few different plastics in the store and jig heads come and have a look remember we have free coffee as well. 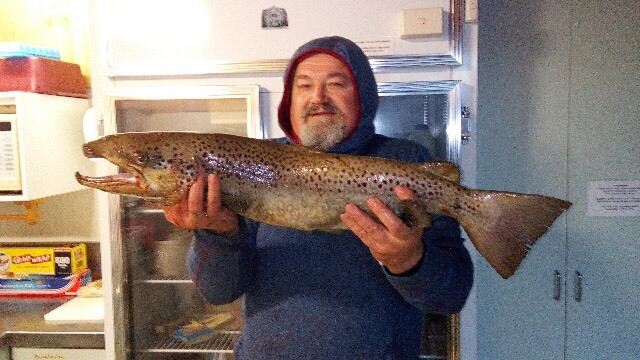 Zlatko Djuric landed a 77cm Brown Trout off shore. He was using a F9 Rapala. It's the one that normally gets away. It had thick braid with hooks wrapped around its tail.